A plan which could lead to the consolidation of two South County police departments met its first serious resistance this week when officers from Grover Beach balked at potential personnel cuts in their ranks. Arroyo Grande and Grover Beach city officials are involved in year-long discussions regarding the melding of their city’s police departments into that of Arroyo Grande in an effort to save an estimated $1 million. 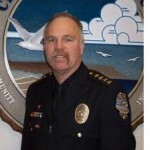 That message was contained in a letter signed by GBPOA president Juan Leon and delivered last week to Grover Beach Police Chief Jim Copsey. Leon said his group’s members were also “highly concerned” about a background, psychological, and medical testing system proposed to be applied to Grover Beach officers wishing to be part of the combined department. Grover Beach officers also objected to a proposed probation period they deemed would be used by Arroyo Grande police officials to eliminate employees who passed the testing, but did not meet Arroyo Grande’s expectations. Copsey said he was “a bit surprised” by the association’s letter, but remains optimistic. Copsey’s original proposal to his council was a concept that did not involve any job cuts, and was one that was supported by his officers. Ironically, Copsey is working on a plan which, if it comes to fruition, might result in the elimination of his own job. The Arroyo Grande City Council Tuesday pushed a version of the plan forward by expanding a study committee to involve the public and a wider variety of interested parties. As a GB resident, I want ZERO part of the corrupt police chief from AG. Ponder this: their own (GB & AG) internal studies have shown that GB does dispatch better & with less expense than AG, but yet AG refuses to us their dispatch. As matter of fact, AG could save a load of money by contracting police services out to GB. This merger is more about politics and the good old boys club than it is about economics. GB city council knows it and is wisely backing away from the move. I live in Grover, a block from the City/Police Building, and have seen both positive and negative examples from GBPD? Found a little bit more in old news articles. Can locals please post about their experiences with both Grover and Arroyo Grande Police officers and department? We all cry foul when our ox gets gored. It would be interesting to see what spot on the priority list law enforcement sits with the city. I think this is one of the last areas to cut… look to the planning department and secretaries. Why do we have so man secretaries anyway? I would think folks would write their own letters and email by now.